The Republic of Mozambique is an African nation, bordered by Tanzania, Malawi, Zambia, Zimbabwe, eSwatini (Swaziland), and South Africa, with some coastline along the Indian Ocean on the eastern edge of the African continent. The capital and largest city of Mozambique is Maputo. 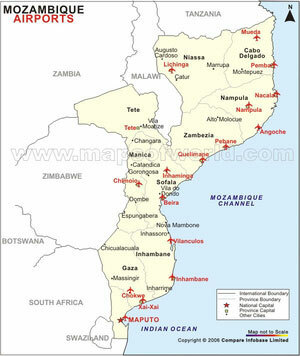 Mozambique has an area of 801,590 square kilometers (309,496 square miles). Swahili and Arab commercial ports had already existed along the coasts. The first European to explore the region was Vasco de Gama in 1498. The region was later invaded and colonized by Portugal in 1505. The Portuguese rule lasted for around five centuries in the region, ending with the country's independence in 1975. The independence was achieved through the pressures of the Portuguese Colonial War that occurred from 1961 to 1974. The most significant guerrilla group was The Front for the Liberation of Mozambique (FRELIMO), which was organized in 1964, and carried out an armed campaign against Portuguese rule. After around 10 years of warfare, independence was finally achieved on June 25, 1975. The years following independence were met with an intense and violent civil war, which lasted from 1977 to 1992. In 1990, talks between the FRELIMO and the RENAMO (Mozambican National Resistance) resulted in the adoption of a new constitution, making Mozambique a multi-party state. After a two-year transition period assisted by the United Nations, the first multi-party elections occurred in 1994 and the country has remained a stable presidential republic ever since. In 1995, Mozambique became a member of the Commonwealth. In February 2000, devastating floods swept through south of the country. Thousands of people were forced to flee from their homes. In March 2001, around 70,000 people were displaced due to flooding in Zambezi Valley. In November 2003, Brazil promised that it would build a plant in the country that would produce anti-retroviral drugs for HIV-Aids patients. In October 2005, work began on the "Unity Bridge" over the Ruvuma River. This bridge was to link Mozambique and neighboring Tanzania. In December 2010, Mozambique became a leading drug trafficking centre, according to classified US documents released on WikiLeaks. In April 2012, Portugal agreed to give up its remaining stake in the Cahora Bassa hydro-electric scheme. This ended a long-running dispute. In April 2014, South Africa and Mozambique signed an agreement for saving the endangered rhino. Mozambique is located in southeast Africa. It borders the Indian Ocean to the east; Tanzania to the north; Malawi and Zambia to the northwest, Zimbabwe to the west, eSwatini (Swaziland) and South Africa to the southwest. It is separated from Madagascar by the Mozambique Channel to the east. 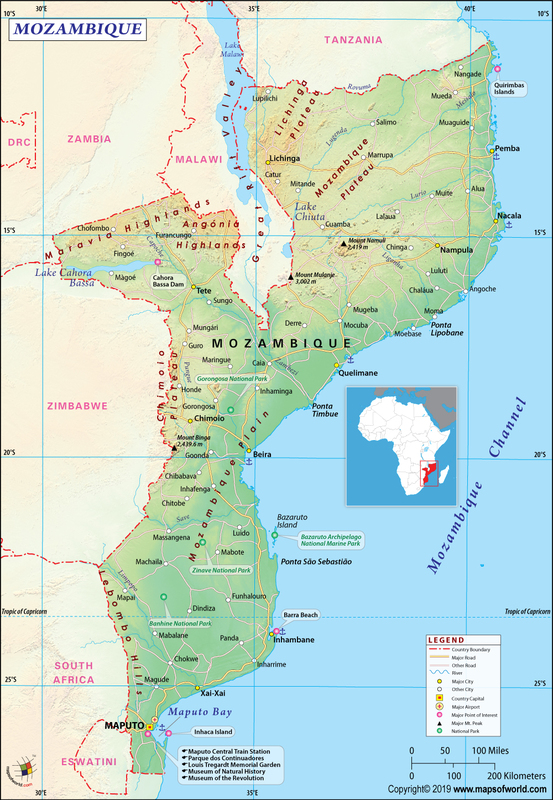 Mozambique is the 35th largest country in the world with a total area of 309, 496 square miles, which is twice the size of the state of California. The climate is tropical to subtropical with two seasons: wet season from October to March and dry season from April to September. Mozambique is a multi-party democracy, as per the 1990 constitution. The executive branch is governed by the President, the Prime Minister, and the Council of Ministers. They also have a National Assembly and municipal assemblies. The judiciary comprises the Supreme Court, and the provincial and municipal courts. Mozambique is fast emerging as one of the top tourist destinations in the world. It is famous for its natural beauty, wildlife, eco-tourism, and historic landmarks. The fastest growing tourist destination in the country is the Mozambique Island. A UNESCO World Heritage Site, the Island is filled with sandy beaches and a rich history that offers both cultural and natural wonders. The Bazaruto Archipelago is a group of six islands that boasts of excellent beaches, coral reefs, fishing, and surfing. Santa Carolina is also called Paradise Island for its natural beauty. Benguerra National Park is the largest of the six islands, and is popular with scuba divers. Unspoiled beaches offer diving, fishing, and horseback riding as popular activities. Quirimbas Islands is located on the Indian Ocean off the northeast coast of Mozambique. It's a group of 32 smaller islands with some of them uninhabited. The Quirimbas National Park is the largest marine protected area in Africa. Plenty of resorts are found around the islands but many areas are also unspoiled and secluded for tourists looking for a tranquil vacation. Gorongosa National Park is located in the heart of the country and is a 4000 sq km. park. It is home to a large diversity of animals and plants, as well as to animals that can't be found anywhere else in the world. Since gaining independence from Portugal, the country has faced many challenges in its educational system. Primary school is compulsory for all children but many of them don't attend or finish. This is because many children in Mozambique are forced into child labor to help the family. Literacy rate in the country is at 56.1%, with 70.8% for men and 42.8% for women. Development of schools and teacher training has not kept up with the growing population. Half of the teachers in the country are unqualified. 1. Portuguese is the country's official language but many local dialects are also being used. 2. Mozambique is one of the poorest countries in the world. 3. Mozambique used to be called Portuguese East Africa. 4. Life expectancy in the country is very low. The average life expectancy is only 40 years. 5. Mozambique dance is famous in pop culture. Famous musicians showcase the traditional dances of the country in their music videos. 6. The country depicts the Kalashnikov gun on its flag. 7. The Vumba Rock Paintings in Mozambique are believed to be around 8,000 years old. These rock paintings depict hunters and other human figures and animals. 8. Maputo, the capital of Mozambique, is also known as the City of Acacias. This is in reference to the acacia trees found along its avenues. 9. Some parts of Blood Diamond, the Hollywood movie starring Leonardo Di Caprio, were shot in Mozambique. 10. Lourenco Marques was renamed as Maputo in 1976. 11. Before Graca Machel became the wife of Nelson Mandela, she was the first lady of Mozambique. Her husband, President Samora Machel, had died in a plane crash in 1986. The national flag of Mozambique was adopted on May 1, 1983. The Mozambique flag is horizontally divided in four colors - green, black, yellow and white.